A good portion of any legal professional’s day is spent writing. Whether creating documents and briefs or transcribing case and client information, it all takes time. Fortunately, there’s an easy way to reduce the time spent on paperwork by more than 50 percent. 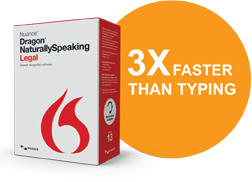 Dragon NaturallySpeaking Legal is three times faster than typing, and because it was created for the legal profession, it accurately recognizes hundreds of industry terms and can learn many more. Dragon works with virtually all Windows applications, and using a digital voice recorder, you can dictate anywhere, anytime. Dragon will automatically download and transcribe your notes when you return to your computer. Tekton helps you get the most from your investment in Dragon NaturallySpeaking Legal. Because Tekton specializes in maximizing the benefits of Dragon, we offer a broad spectrum of support and services delivered by qualified IT professionals. From customization to deployment to ongoing support, we’ll ensure your organization gets the most from Dragon speech recognition software. You can count on us to provide you with everything you need to succeed and keep your organization moving quickly and focused on what they do best – more time achieving their mission and less time with paperwork. To find out how Dragon NaturallySpeaking Legal can make you and your law firm get more done in less time, contact Tekton today. Tekton is the go-to source for equipment, software, and expert consulting for speech processing, voice recognition, and transcription. Tekton offers the latest portable and integrated digital / mobile dictation products from Winscribe, Philips, Dragon, and Olympus. These tools enable increases in productivity for many organizations. Tekton serves the Mid-Atlantic and Southeast regions of the U.S. with offices in Chapel Hill NC, Pittsburgh PA, Richmond VA, and Columbia SC. Including the states of Delaware, District of Columbia (DC), Maryland, New Jersey, North Carolina, Ohio, South Carolina, Virginia, West Virginia, and beyond. Also serving Raleigh, Durham, Greensboro, Charlotte, Washington DC, Baltimore, Philadelphia. This entry was posted in Uncategorized and tagged digital voice recorder, Dragon NaturallySpeaking Legal, IT professionals, less paperwork, maximize benefits, ongoing support, typing. Bookmark the permalink.